When you enter factory mode on Lava Iris 405 smartphones, you are entering the equivalent of a recovery mode on other handsets. Here you can regain control of your device and get rid of any bugs by performing several tasks. People who enter factory mode on Lava Iris 405 handsets want to either Auto Test, run a Test Report, Item Test, Debug Test or clear the eMMC. By clearing the eMMC, you are resetting the device with a hard reset. Once you hard reset the device, you have wiped all the data you previously had the device, including your settings, pictures, text messages, music and video files. You can find the factory mode available on many Lava handsets. However, we only advise you follow these steps on the Lava Iris 405 device. You can check your devices model number from the menu and make sure it matches up with the 405 model before continuing just to be safe. Make sure you backup the Lava Iris 405 device before starting the guide. When you enter the factory mode on your handset, you are entering an area that can wipe your data. If you don’t want to risk losing sensitive data like your contacts, we advise you backup before going any further. Make sure you have enough battery left on your Lava smartphone or else it might shut down during the guide. Since it’s a sensitive partition on your device, you do not want it to be shutting down during this time. Start by long-pressing the Power button until your device turns completely off. Reboot the device by holding the Volume Down and Power buttons at the same time. – make sure you did press both the buttons simultaneously or else this does not work. Most problems are due to the fact that the buttons were not pressed together correctly. Wait until you see the Blue menu on your devices display. 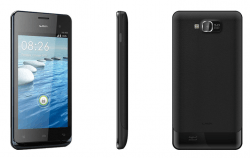 Now you can release the keys and use the factory mode on Lava iris 405 handsets. Scroll down the list and highlight your preferences by tapping the Volume Down key. Choose the option you want by tapping the Power key — just like you would from the stock recovery in menu Android devices.